1 PETER 2:24 KJV "Who his own self bare our sins in his own body on the tree, that we, being dead to sins, should live..."
21For even hereunto were ye called: because Christ also suffered for us, leaving us an example, that ye should follow his steps: 22Who did no sin, neither was guile found in his mouth: 23Who, when he was reviled, reviled not again; when he suffered, he threatened not; but committed himself to him that judgeth righteously: 24Who his own self bare our sins in his own body on the tree, that we, being dead to sins, should live unto righteousness: by whose stripes ye were healed. 25For ye were as sheep going astray; but are now returned unto the Shepherd and Bishop of your souls. Who his owne selfe bare our sinnes in his owne body on the tree, that wee being dead to sinnes, should liue vnto righteousnesse, by whose stripes ye were healed. 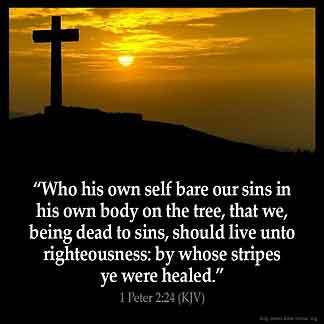 who his own self bare our sins in his body upon the tree, that we, having died unto sins, might live unto righteousness; by whose stripes ye were healed. who himself bore our sins in his body on the tree, in order that, being dead to sins, we may live to righteousness: by whose stripes ye have been healed. Who himself bore our sins in his own body on the tree, that we, being dead to sins, should live to righteousness; by whose stripes ye were healed. The burden of our sins He Himself carried in His own body to the Cross and bore it there, so that we, having died so far as our sins are concerned, may live righteous lives. By His wounds yours have been healed. who his own self bore our sins in his body on the tree, that we, having died to sins, might live to righteousness; by whose stripes you were healed. And he hym silf bar oure synnes in his bodi on a tre, that we be deed to synnes, and lyue to riytwisnesse, bi whos wan wounde ye ben heelid. 2:24 Who himself bore our sins - That is, the punishment due to them. In his afflicted, torn, dying body on the tree - The cross, whereon chiefly slaves or servants were wont to suffer. That we being dead to sin - Wholly delivered both from the guilt and power of it: indeed, without an atonement first made for the guilt, we could never have been delivered from the power. Might live to righteousness - Which is one only. The sins we had committed, and he bore, were manifold. 1Pe 2:24 Who his own self bare our sins in his own body. Died for our sins, not his own. He took our burdens. On the tree. The wood of the cross. That we, being dead to sins. "Crucified with him" (Ro 6:6), penitent, the repentant sinner is baptized into his death, and rising to a new life, "lives to righteousness". By whose stripes ye were healed. See Isa 53:5-6. Jesus is so wonderful. He was so innocent. Yet he went through all the pain and suffering that we might be saved. I 'm so thankful for what he did for all mankind. He is king of kings and lord of lords and my personal savior. Thank god my father and thank you my lord Jesus christ. The word of God always brings comfort and we can rest assured that He will do what He says. Very helpful. I was sick and feeling sorry for myself. Shame on me. I am blessed to be a child of God. It was helpful to me, a child of God who doesn't everything and need guidance.